Participants practicing skills of passing and ball catching. 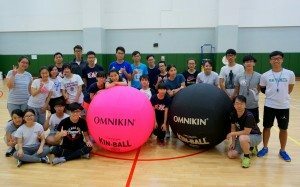 On 10th September afternoon, Stanley Ho East Asia College (SHEAC) and the UMSU Kin-Ball Club co-organized the Kin-Ball Fun Day. The President and two coach assistants from the Hong Kong Kin-Ball Association (HKKA) were invited to coach. More than 20 students joined in the event. 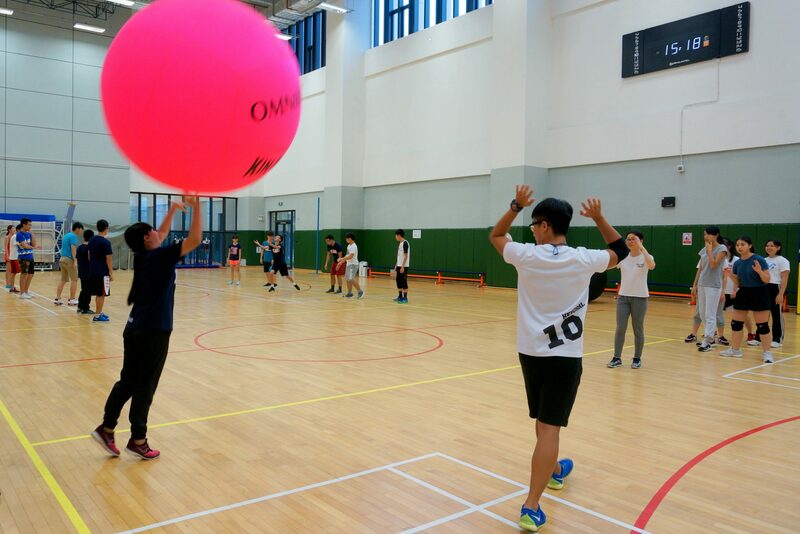 Participants learned basic rules and practiced several techniques in the first part, and played kin-ball in teams in the second part of the activity. 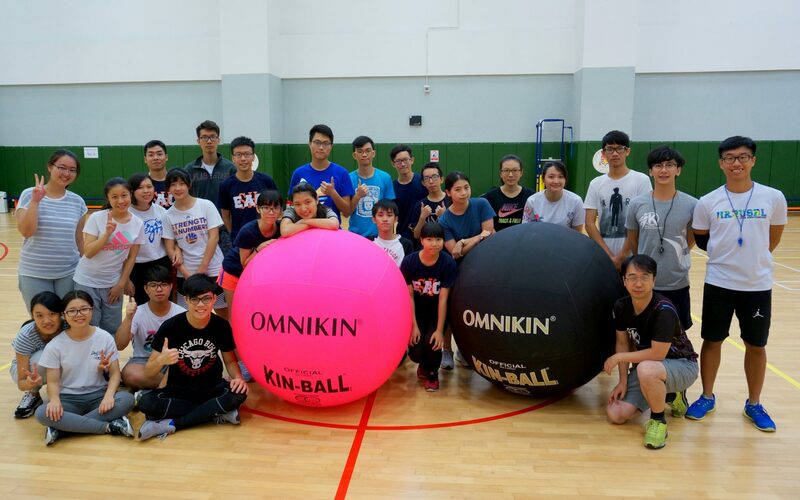 On one hand, kin-ball is relatively easy to learn and it puts emphasis on team spirit and communication between team members. 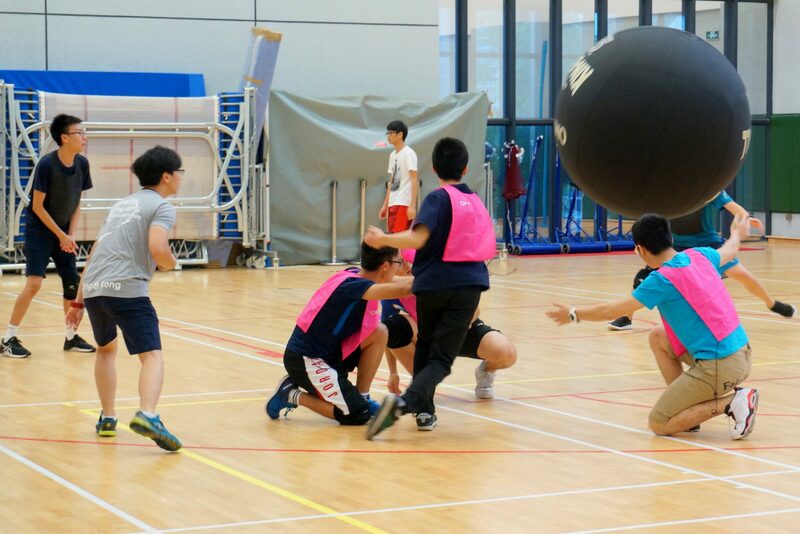 On the other hand, in terms of skills and teamwork, kin-ball can be very competitive. Participants learned about the importance of cooperation while stress was ‘sweated’ away. They also expressed that the activity provided them a novel experience, and some have become fond of this sport. Group photo of all participants and the coach team from HKKA after the event. Kin-ball is originated in Canada. 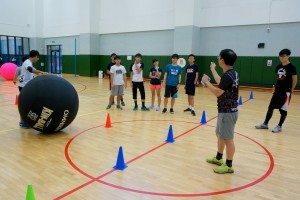 The inventor’s aim was to motivate more students to participate in sports, as kin-ball emphasizes teamwork, respect and inclusiveness. Since November 2015, SHEAC and HKKA have co-organized a series of kin-ball activities, including experiential sessions, beginner and intermediate training, level-1 coach, and level-1 referee courses; over 100 participants have joined, a sign of growing popularity in the UM community. 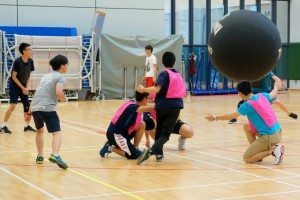 In April this year, SHEAC students, with students from Choi Kai Yau College (CKYC), formed two teams to participate in the Hong Kong Kin-Ball Championship and achieved satisfactory results. In July, the UMSU Kin-Ball Club was formally founded. The coach introducing the basic rules of kin-ball. Team members worked with each other in a friendly match.